Writing auction titles on eBay.com seems deceptively easy. But snaring more bidders in online auctions means carefully considering keywords in every title you write, and being eloquent isn't as important as you might think. Why? Because most eBay searches are conducted on the title field only, and that's how many bidders will find your auctions among thousands of others. Avoid listing title pitfalls, and put yourself in the searcher's shoes, with these helpful tips. Take advantage of all 80 characters you are allotted for your title to make sure you have covered all your bases when it comes to keywords. Doing so will optimize your success selling on eBay. Include words that will appeal to both avid collectors and casual shoppers. Avoid listing titles that are too simplistic. A listing title like "Rhinestone Necklace Set" doesn't offer near enough information about the listing. How old are the pieces? What color are they? Are they signed (don't overlook a mark, as noted below)? Start with the basics and add as many pertinent words as possible. Do avoid adding spammy words that do not pertain to your item though. Many listing titles on eBay are swamped with meaningless characters like plus signs, tildes, exclamation points, and the like. While they are supposed to be eye-catching, these characters do absolutely nothing to educate potential buyers about pieces your are attempting to sell nor do they entice them to bid. You'll be far better off using that space to add relevant keywords, thereby increasing the odds of potential buyers actually finding what you have to sell when conducting a search. Using a phrase like "very nice" in your listing title does nothing to maximize exposure. Few bidders will conduct a search for a "very nice pitcher," a "very nice tiara" or whatever it is that you are trying to sell. Leave out this type of language unless you have exhausted your keyword options and still have room in the title for something extraneous. Whether you're selling paintings, pens, or pottery, strive to make every word address the search parameters of your potential bidders. Make sure you're representing the item correctly. If it's a green Depression glass pitcher you're listing, don't mistake it for a vaseline glass pitcher (even though the two types of glass do have some qualities in common). 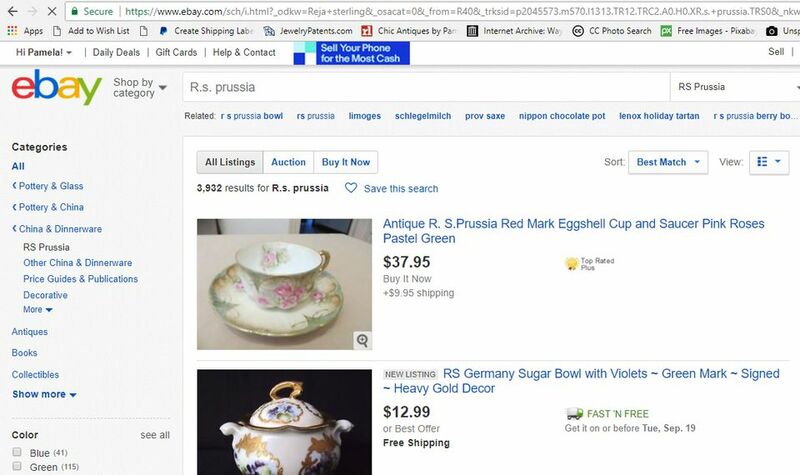 Bidders searching for true vaseline glass, which is more yellow in appearance (like petroleum jelly, hence the name) and older than Depression glass, probably won't be interested in your offering. And people really looking for Depression glass won't find your listing at all. Leaving the maker's mark out of your title is never a good idea, no matter what you are listing on eBay. If your item is marked, make sure you say so in the title. However, don't just say that the piece is "signed." Go ahead and put the name of the maker or artist in the title if you can correctly identify it. That way, bidders looking for a piece with particular signature will zero in on your listing through the search engine. Bidders will find your auctions if keywords are spelled correctly, and you'll be demonstrating your professionalism as well. Many eBayers see sloppy titles as a reflection of how sellers generally handle their business, and avoid placing bids accordingly. If you have room, however, using a commonly misspelled word in a title might work for you. For example, including "Steiff" and "Stieff" or "brooch" and "broach." Just be sure you don't refer to a necklace as a "neckless." That just looks silly. To determine which keywords you should use, ask yourself about words bidders who are looking for this type of item will type in the search field. Each item will have a unique set of keywords best suited to maximize the number of search hits your listing receives. Suppose you plan to list a pink Depression glass butter dish in the Cube pattern, sometimes referred to as "Cubist" by collectors. A complete title like "Cube Cubist Pink Depression Glass Butter Dish" is necessary to reach your bidders. What's the difference between R.S. Prussia and RS Prussia? A couple of simple periods. But when searching on eBay, bidders might use one or the other and omitting the periods can keep a potential buyer from finding your listing. And to complicate matters, some collectors refer to R.S. Prussia as simply RSP. Using as many of these abbreviations as possible in your auction title will net more positive search results. For instance, consider using a complete listing title like "RS R.S. Prussia Countess Potocka Portrait Plate RSP" to cover all your bases.